Brazil nuts are often harvested from trees in the vast forests of Brazil and Bolivia. The trees, simply called Brazil nut trees, need to be pollinated by bees and can only do so in pristine conditions, which is why they do poorly on plantations. 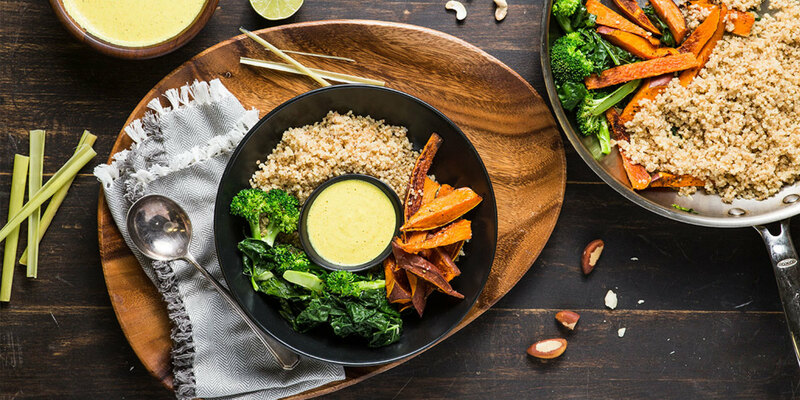 In this recipe, we blend them along with cashews to make a protein packed, light, and creamy curry sauce. Lacinato kale and broccoli are drizzled in the golden yellow sauce, be sure to enjoy the remainder sauce on the side. In a small saucepan, combine the white quinoa, 1½ cups water, and a pinch of salt. Place over medium-high heat and bring to a boil. Reduce heat to low, cover, and cook until the quinoa is tender, about 12 to 14 minutes. Turn off heat and let sit, covered, until it’s time to plate. Place a large skillet over medium-high heat and add 1 tsp vegetable oil. Once hot, add the broccoli and cook until bright green and tender, about 2 to 3 minutes. Add the garlic and saute until fragrant, about 30 seconds. Add the kale and 2 tbsp water to create a bit of steam. Cook until kale is slightly wilted, stirring frequently, about 1 minute.